The heat pump needs an energy input (electricity) to drive the compressor and a measure of the efficiency of a heat pump is the ratio of heat generated to the electricity used to drive it. A typical ratio is 3 to 4x. This is important for assessing the potential economics of a heat pump. If you are using normal domestic mains electricity at say 13p/ Kwhr, then it is hard to justify substituting gas for heating if this is charged at say 4p/ Kwhr, but will make more sense if you are substituting higher cost fuels such as oil or logs. In the case of the hydro the 'cost' of the electricity is relatively low in that the alternative use value is c. 3p /Kwhr that is payable for electricity exported to the grid. A domestic 'Renewable Heat Incentive' has been implemented (after many delays). Our scheme, however, has ended up qualifying for the 'Non-Domestic RHI Scheme' on account of the property being considered as 3 separate units for council tax purposes.. The different schemes may end up delivering similar levels of revenue but the 'non-domestic scheme' results in smaller annual payments, but paid over a longer period of time. ie over 20 years, with a rate for water source heat pumps proposed at 8.7p/ KWhr. This rate is applied to the heat generated net of the electricity required to generate it; ie in our case 70K Kwhr less 20k KWhr = 50k KWhr. The in river heat exchangers ended up being quite expensive as we ended up specifying stainless steel food-grade kit for security over lifetime and avoiding corrosion risks. A future scheme could probably halve these costs. Even so, the payback is set to be respectably under 10 years. 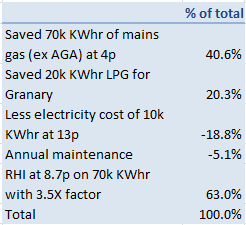 Were we to have reduced the heat exchanger costs and balanced our electricity usage to avoid importing, the payback could in theory have been an impressive 6.2 years - reflecting the benefit of having very low/ zero opportunity cost for the electricity required to drive the heat pumps. Looking at the combined hydro/ electric and heat pump system, if we exclude the special costs of the new river gate and the fish pass, then the combined payback should be 8.2 years, and should be slightly better as we have not made allowance for rpi increases in the FIT and RHI payments. (On the other hand we have not adjusted for changes in future gas, lpg and electricity prices which may be going down before they go up). Even if we include the costs of the new river gate and fish pass the combined payback is still 11.4 years, slightly outside our target but not bad.